Please refer to our stock # 386 when inquiring. SOLD...thank you very much C.
With childlike expression pretty 14" ( 36 cm ) fashion doll which comes from the same time era like an Huret poupee , has an fine pink tinted porcelain shoulder head with plump round face with beautiful dramatic blue inset glass eyes with rare pale modeled eye lid , has dark eyeliner and delicately painted lashes and brows. Closed mouth with accent line between the fine painted lips , flat ears and original blonde mohair wig over cork pate. She has her French original kid poupee body with gusset jointing at heep and knees with kid arms and separately fingers. The doll is in all complete generally excellent condition with perfect head and shoulder plate .... free of damage , hairline , chip or repair !! Her original body is in good condition to age .... note some small patches at her arms, please see my pictures. Wearing very beautiful with rich set of under garment , pretty enfantin costume of muslin blouse and skirt , light lavender silk upper skirt , muslin collar and finally nice enfantin straw bonnet. She has antique stocking and pretty replaced heeled booties . 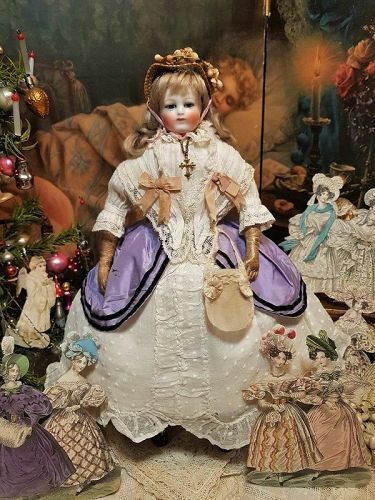 Rare and so charming petit size with lovely complexion , original body and pretty clothing so that she is ready to display and enjoy in your cabinet !!! Please let me know if you have any question or if you need more or special pictures and thank you very much for your interest on my Doll-Shop ! !